Summers are meant for long lazy days spent in the great outdoors. Whether you are at the beach, packing a picnic in the park or spending the day in your own backyard, it is important to seek out shade. This is especially important for those with families or with incredibly fair skin. The sun can do a number on us from brutal sun burns to an even more threatening sun stroke. Being able to escape into the best beach tent will ensure that you don’t have to sacrifice your prime spot near the water in order to keep your family safe. This will help you to get the most out of summer by being able to enjoy the heat for longer. Below we have listed the best beach tents on the market this year. These come in at an affordable price point with technology that keeps your family safe and happy. 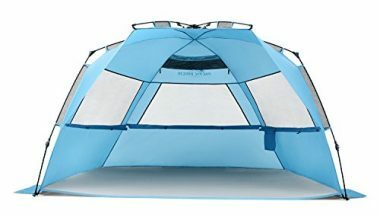 This is the best beach tent for busy families that don’t want to spend a lot of time struggling with setup and takedown. The EasyUp tent has a great design that is incredibly user friendly and allows you to spend your time enjoying the sun. The lightweight and compact tent design makes carting it around incredibly easy allowing you every opportunity to get the most from your day. This tent is not just a good option for lazy days on the beach but is incredibly versatile offering protection from rain and wind as well. This makes it a great option for virtually any outdoor activity from soccer games to days at the park. Large windows allow for excellent ventilation and the entire tent has UPF 50+ protection. The spacious interior will fit the whole family and even has internal pockets so you can store all the days personal items with ease. Lightweight doesn’t mean sacrificed durability with this tent as the fiberglass frame is incredibly strong and even waterproof. Included in this set is a carrying case, sand pockets and stakes which leaves you ready for your day. Pacific Breeze is known for its quality customer service skill which makes this the best beach tent an even better buy. With any questions or issues with your tent, they have an easy to use phone or email support system, as well as an, included 1 year limited warranty. Coleman is a trusted name in the outdoor world with this beach shade tent being yet another of its superior products. Made using high quality materials including an incredibly durable fiberglass frame this tent was built to last. The large size tent provides excellent coverage for the whole family. Pacific Breeze is on our list twice and for good reason. 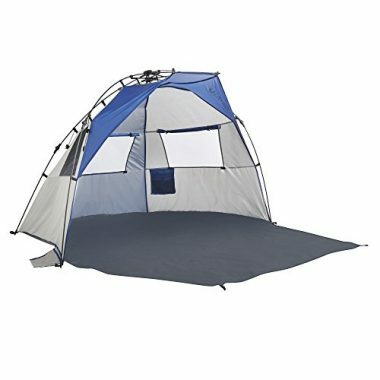 This best beach tent is much like the other but offers a more spacious design that comfortably fits 3-4 people inside. 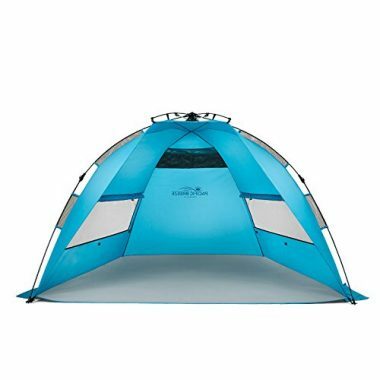 This extra size does not increase weight by much as this extra large tent is a mere 6.5 lbs. It does, however, carry the same easy to set up design featured in the smaller tent. This easy setup tent design makes it easy for a single person to do. This compact summer tent folds up to a convenient travel size that is easy to carry while being lightweight enough for long hauls. With the same UPF 50+ protection your whole family can sit safely in the shade and avoid the inevitable summer burns. The water-repellent polyester material performs well in rain and windy conditions as well. It is also incredibly breathable making it great for even the warmest of days. With three large windows you are able to open up and provide some airflow and ventilation inside the tent. 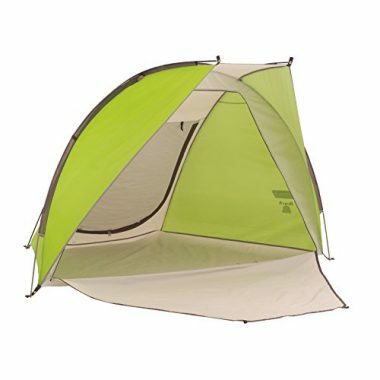 This tent is made for full day fun with 5 sand pockets included giving you enough area to store your gear. A carrying case is included for easy transportation between your car and the beach. This consumer friendly company backs its tents up with an incredibly appealing one year warranty. Beach canopy reviews are raving about this all-weather portable tent. With a UPF 50+ rating this is a great summer purchase. Safe from over 99.5% of UVA and UVB rays this is a great option for those looking for a summer all in one special. This canopy comes with side panels and wind flaps that provide extra protection while still providing excellent ventilation. This canopy is great for kids sporting events. This 8 foot canopy cover is made using 210 D Polyester which means that it is built to last. This durable shell is a must for all-weather protection. This beach shade looks like an umbrella with two sides that stake into the ground giving it a secure tent like structure. This is a great option for small families looking for an incredibly easy setup. The large 8 foot wide design provides adequate shade and rain protection. 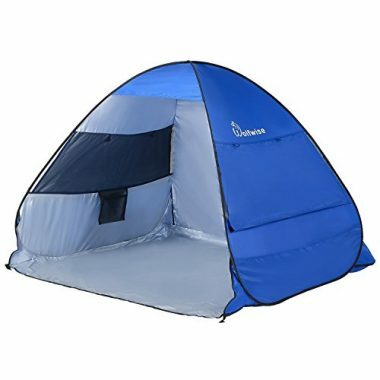 This tent even has windows that can be lowered to provide easy airflow and better visibility. This umbrella tent is an all in one coming as a complete package with 3 tie-down cords and 8 stakes to help secure it. This tent works well in all weather conditions even being water repellant which will protect from rain and wind. Lightspeed makes a great outdoor beach tent with this one. With a complete UPF 50+ protection this is a great option for keeping you and your family safe from the harsh summer sun. The lightweight tent design sits at a mere 6.1 lbs making it easy to take around. This tent excels in durability making it a great option for those with kids and pets. More than just the internal tent, it comes with a sort of porch space that allows you to take full advantage of your surroundings. This tent has 3 windows equipped with shades that allow for ventilation without compromising on privacy. This means that you and the family do not have to compromise on a great day in the sun no matter how hot it is outside. This tent comes as a complete package with a large oversized carrying bag, sand pockets to protect your gear and 8 stakes all included. Coming with a complete and tempting 1 year warranty making this tent an even sweeter deal. Simply take this Shade Shack tent out of the package and it springs into action. The unique shape shades your entire family from the sun while being lightweight enough to take anywhere. Three walls protect you while still being able to see the amazing views. Simply store this compact tent in the trunk of your car and you can go to the beach whenever you want. If the winds pick up simply fill the sand pockets to ensure the tent stays where you want it to. The material uses a zinc coating over a polyester fabric. 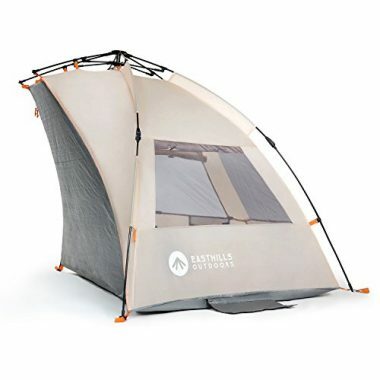 This creates a durable skin on your tent that also protects you from the sun. Unlike other tents on this list the Super-Brella does not have a floor. It is made by a tough 190T polyester material that is weather repellant. The large 4 millimeter steel ribbing ensure that this tent keeps its shape even through tough wind storms. This tent has an UPF rating of 50+ which means it filters nearly all of the harmful ultraviolet rays from the sun. There are many windows that can be opened or closed depending on the weather. All of this folds up into a small package, much like that of a camping chair. 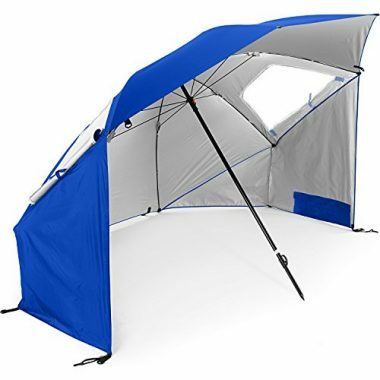 This is one of the top rated beach shade tents on the market. The unique shape of the Easthills Outdoors sun shelter has been specifically engineered to provide shade, floor space, and outdoor room. One of the walls folds down giving you space to put a blanket down without getting it sandy. Two chairs can fit comfortably inside the bay. The 185T polyester fabric shell protects your skin and eyes from the harmful UV rays and even rain. Three mesh windows allow air to pass through and create a crossbreeze and can be folded down for more privacy. When the bugs get to bad simply fold up the flap and you are secure. This big blue tent has a floor that can extend outside of the cover giving you more living area. The OutdoorsmanLab tent has a patented setup system. There is a large window that lets a nice breeze for those hot days. The fabric provides the equivalent of high SPF sunscreen without getting greasy. It also stands up to the wind. There are sand pockets and pegs that keep this tent secured to the ground. You don’t have to worry about it flying away while you’re playing in the water. Not only are there big pockets, there is also a hanging hook so you can hang your bathing suit to try. Coming in at under three pounds the WolfWise tent doesn’t take much effort to carry to your perfect spot. This tent is enclosed on three sides which give you protection from the elements. It even comes with a UPF 50+ rating. This essentially means that while you are under it, even in direct sunlight, you will not get a burn. It is like wearing sunscreen without actually wearing sunscreen. This is due to the 190T polyester fabric that has been designed to be tear resistant. When coupled with the corrosion resistant steel wire frame this is a highly durable and lightweight tent. To set it up all you have to do is take it out of the package and extend it to position. It only takes seconds. As an added bonus, this tent has two large mesh windows that provide ventilation. Your love for the beach doesn’t have to change when you have kids. While there will need to be more planning, being outdoors is important to you and it should be treated as so. Having an outdoor beach tent can allow you to spend much more time outdoors. 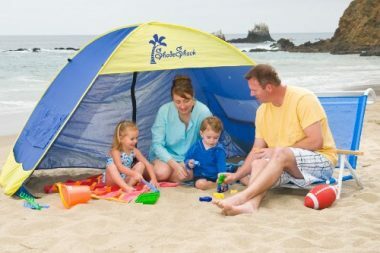 From the beach to the soccer field to a happy family picnic, being able to bring some needed shade with a nice beach tent with you will help you to better enjoy those hot summer months. A portable beach tent is a great way to keep your experience outdoors fun and safe by providing protection from the harsh elements. These tents have many uses which makes them incredibly ideal for the whole summer season. A great investment, a summer beach tent will help encourage outdoor play with your children and work to reduce indoor screen time. In order to find the best tent ofor your family be sure to look for the following main features. There are a few different types of materials companies use for beach tents outer shell. The two main types are polyester and nylon. Both of these fabrics are excellent at creating shade while also being water resistant and long lasting. Some of these tents will also have openings that you can close when the wind picks up. This option gives you even more protection against wind and even bugs while you eat lunch. Being able to close your tent will also add an extra layer of security to your belongings when you’re in the water. The frame of your tent will be made from a lightweight yet strong and durable material. This is usually seen in an aluminum or steel construction which also allows them to be used in saltwater situations without seeing the effects of rust or corrosion. You will also love that you can easily carry your tent to your spot on the beach. A beach carrier will help you move your stuff in one trip, but you won’t have to rely on it to get your beach canopy there. The only consideration is the wind. An aluminum frame will be better for beaches that don’t have strong winds. It is one of the lighter options which makes it OutdoorsmanLab. Steel, although heavier, is more ideal for windy conditions. You will want to consider how many people you are wanting to fit comfortably under your tent. Most beach tents are designed to fit a family of two adults a couple children. Rather than just considering seated space, you will want to keep in mind that your children will likely not want to sit still and rather will need some area to explore and play. Some tents are large enough to even fit a few beach chairs and a table. Paying attention to the size of the tent that works best for your family is important. Many tents come in a variety of different fun summer colors. This allows you to pick and choose the colors that you like best for your tent. Often times tents come in a variety of bright summer colors. Choosing bright colors are ideal as your tent will be most easy to spot at the beach. With so many options you are sure to find your favorite color tent amongst the mix. This is infinitely important, especially with little ones in tow. You will want a tent that is easy to transport to and from the beach. Keep in mind that you are likely to have your hands full with coolers, towels, chairs and your child. Having a tent that is lightweight and compact will help to make it easier to move around. 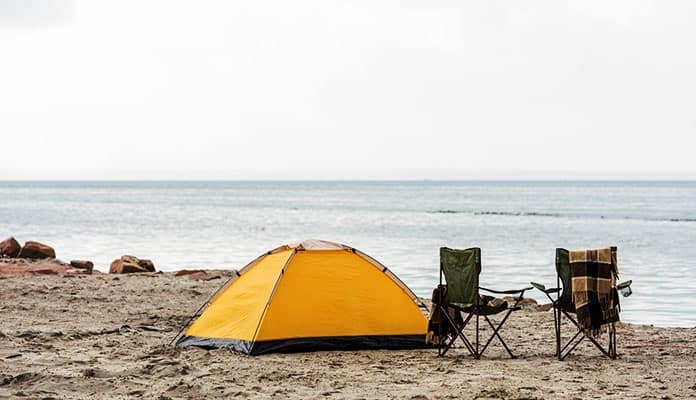 Once you have your tent at the beach, you will want something that you can set up relatively quickly and easily. You want to limit direct sun exposure so having your tent set up and functional quickly is incredibly important. While they may be called a beach tent, you will likely get a lot more use out of these. 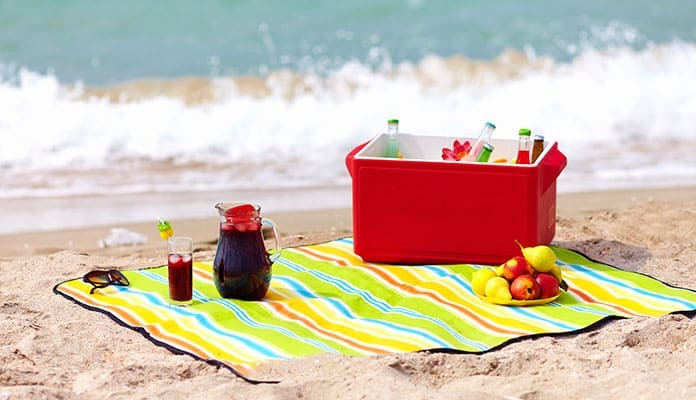 Going much further than simply beach use you can bring your beach towel and beach tent with you almost everywhere to help make the most of summertime. Having a spot to keep a few of your valuables is important. Many beach tents come with pockets that are ideal for housing your waterproof camera, phone, and keys. You will be able to throw your towels, water bottles, and coolers under the beach tent as well to help protect your gear and keep it cooler. A safe home tent for your valuables will help to keep them out of direct view for people who may have wandering eyes while you are on the beach. This adds an added layer of privacy which can be quite welcomed. These pockets in your tent can also help to preserve the life of your gear. Keeping it up and out of the salt and sand will help to keep your gear working like new. At the beach, you are completely exposed to the elements. More than just the sun you will be exposed to the wind as well as salt and sand sprays. Having a tent shelter can work to make your family much happier and having fun. Take it to a rainy sports game and enjoy from the sidelines while keeping your family dry. You are incredibly exposed at the beach to more than just the elements. Gain some privacy with the help of a beach tent. This will allow you to change in privacy, take a nap or simply unwind. A great place to store your snacks and coolers tents provide much needed shade that will keep your food fresh. This will prolong the ice and cool packs in your cooler. Additionally, you can keep your water cool and your food from sweating. As many tents have floors you will be able to have your food clean and free of sand. This can go a long way especially with children who are picky eaters. 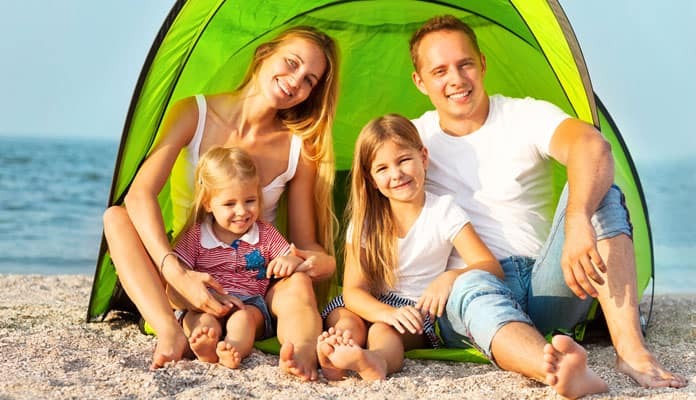 Beach tents are the perfect accessories for families as they provide endless benefits to kids. More than just an issue for harsh sun, the sand can get hot which makes providing shade even more important. Tents can make your day in the outdoors much more fun by giving your little one a safe place to nap, enjoy some milk or just take a break from the hot sun in your tent. Setting these beach tents up is one of the easiest things you can do. A tent will usually just fold out from themselves and require you to snap some clips onto the frame. All in all, they will take less than 10 minutes to set up your tent. What to Look for When Buying a Beach Canopy? When you are looking for your next beach canopy, you will want to pay attention to a few different features. Knowing what to look for in a tent before you make the purchase will ensure that you get the most of your purchase. There are many different types of beach tents. It may look similar to a beach canopy but these have a few differences that make them better suited for their use. Just like a camping tent, the beach tents will have a piece of material that creates a barrier between your gear and the ground. This will not only keep sand out but protect your feet from the hot sand. Most of these specialized tents will have at least three sides – while some have four. This will give you shade and protect you from wind and rain. The last side gives you an easy to access doorway. One of the drawbacks to a traditional tent is that it’s hard to enter and exit, but you won’t have that issue with this style. This hybrid style covering merges the best of a cabana and a beach tent. Canopies are often incredibly easy to set up using a pop-up style installation. These durable shade coverages are quite lightweight and compact making them ideal for beach use. 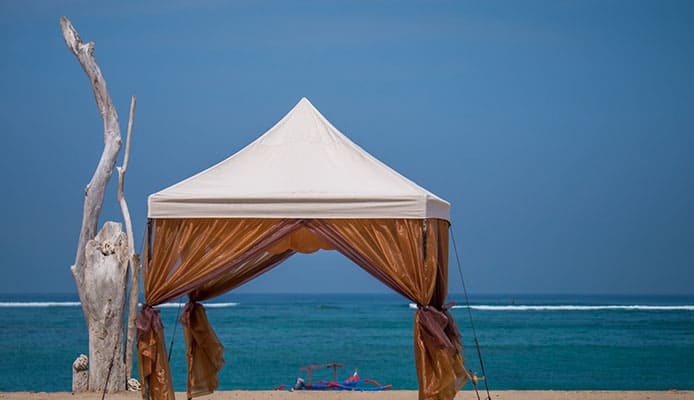 Typically this beach canopy style is anchored using sand pockets which contribute to the ease and lightweight design and make them quite sturdy. This style of beach canopy cover is ideal as they are typically larger than tents and create a more spacious shaded area that more and more people will enjoy. This is one of the most robust beach tents of the market. With that being said, they also take a longer time to set up and transport. You will find that the materials used in this tent’s construction make it heavier and less likely to fly away when the winds pick up. Sun shelters come in many different sizes and shapes. The size of your tent shelter will be determined by the size of your family. A family that has 5 members will need a much larger tent shelter than a family of even 3 people. Different style beach tents will also be more open which allow more people and gear to spread out. A gazebo style tent, for example, will give the space larger families need. Another key aspect you should consider is the height of the beach tent. It should be high enough for you to at least sit on the floor without having to bend your head. You will want to place a serious importance on getting a beach canopy that is lightweight and compact. Luckily, most companies go out of their way to ensure that their tents carry this lightweight design which will make it easier for you. You will want to ensure your tent gear is easy to set up and take down as well. You will want to make sure your beach tent has a carry case, a lightweight design, and a shoulder strap. This makes the tent easiest for transportation. As with any other purchase, you make it is important to make a budget for your beach tent. Knowing how much you are willing to spend before you make your purchase is incredibly important. This will help to limit your options as well as make you feel much happier with the beach tent you choose. It is best to take a look through the market so that you can get an idea of the realm of prices that these beach tents typically go for. There are many different styles of tents to choose from. Some tents offer maximum shade while others can be used to create shade in the water. A canopy beach tent is perfect for gatherings on the beach. This beach canopy will provide enough shade for a lot of people. Bring this along for beach parties or family reunions on the beach and know that you will be sitting in shade. They are not that hard to set up and are ready in a matter of minutes. The whole family should be able to enjoy the beach. This includes your babies. These tents are small as they only need to create shade for the smallest people. 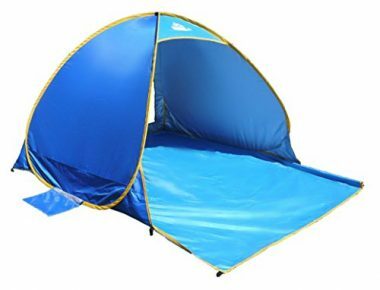 Since these beach tents are for small children they are made out of high quality material and can be used in more situations than just the beach. They are even perfect for the backyard to keep your children safe from the sun. These are large tents that protect your family from not only the sun but also other elements, like wind and rain. Cabana tents are large enough for a regular sized family to all have a seat in protection. They can feature pockets, even pet doors to make life more comfortable at the beach. Some even come with a zippered wall that allows you to change into your bathing suit with complete privacy. This style tent has been designed with an easy setup in mind. All you have to do in order to set this tent up is take it out of its bag. There is usually a spring that snaps this tent into place. Not only are they super easy to setup, but also takedown. Q: What’s The Best Beach Tent For Babies? A: Going to the beach with a child requires a lot more planning, preparation, and gear than a solo trip. As they have such sensitive skin, providing UV protection is so important as their delicate skin can become easily burned. Choosing the best beach tent for your family comes down to a personal choice. This should be based on the climate you live in, how many people in the family and personal preference. Every parent knows how hard it can be to keep your child still. This is why we recommend a bigger tent so your toddler has room to explore while still being protected. You will also want a beach canopy tent that can stand up to your climate. 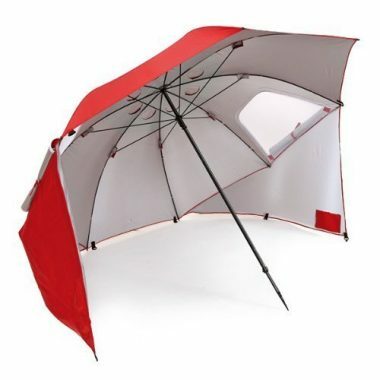 This includes tolerance to wind, waterproofing features and a strong enough UV coverage. Looking for key features to your tent is important. This includes a lightweight tent design that is easy to set up and take down. All of the tents on our list should work quite well in order to provide adequate safety protection for your family. We especially like the Pacific Breeze Easy Up Beach Tent as it has a large surface area of 50+ SPF protection. It is made using waterproof material which makes it ideal for a variety of different weather conditions. Q: How To Anchor A Beach Canopy? A: Most often beach tents will come with stakes that help you to secure it into the ground. You will find that there are pockets near the bottom of the canopy. If you are on a sandy beach you can simply move some sand into the pockets which adds weight to the beach tent thus anchoring it to the ground. If you are on a more rocky shore filling the tent pockets with rocks will have the same effect. Some other tents include stakes that you have to put into the ground. The trick with these is, when you’re on a sandy beach, to dig a small hole and use the stake in the wet sand. It will stay longer and create a better anchor for your tent than in the dry sand. Q: How Much Are Beach Tents? A: The price of beach tents can vary significantly. This can be affected by the size, materials and even the company who makes it. A standard beach tent can range from $150 to $450. But with that being said, you don’t have to spend a fortune to have a great time on the beach. Q: How To Keep A Beach Canopy From Blowing Away? A: Companies have gotten smarter about keeping their beach tents from flying away. Most beach canopies have pockets that you can fill will sand or rocks that act as anchors that keep them secured to the ground. If your beach tent doesn’t have these pockets you can easily secure it to the ground. This can be done by adding rocks to the tent legs that rest on the ground. If you are bringing drinking water for the day you can put it in gallon milk jugs and then attach these to the legs also. This will combat even strong winds ensuring you have the protection from the sun you need. Q: How To Refold Beach Tents? A: When you are taking your beach canopy out of the package look at how the company folded it. Some tents will have a bendable frame that makes refolding it easy. Others will have to have the fabric part separated from the frame to be able to be refolded. If you see how your tent has been folded by the manufacturer you will have a better understanding of how the tent will fit back into its package. Q: How Well Do Tents Work On The Beach? A: When set up properly beach tents work well. They give you the shade you need without being as flimsy as a beach umbrella. You won’t have to worry about angling an umbrella when the sun moves across the sky or how the wind will affect it. The shade and shelter you get from the elements with your beach tent are second to none. There is almost no other way of getting this much protection from the sun and wind – besides sitting under a large tree, but these can be hard to find on the beach. From umbrella shaped to enclosed rooms, all of these beach tents offer something different. Beach shelter reviews agree that no matter which one you choose you will be protected from not only the sun, but also other inclement weather. These pop up sun shelters are easy to setup and takedown while being lightweight enough to take anywhere. By using these best beach tent reviews you will be able to make the best decision for your family. New to Beach Tent or have a Beach Tent on our list? Let us know how you like it in the comment section below.